After some attention and a little TLC, the gravestones of service men and women shine with glory in the summer sun. 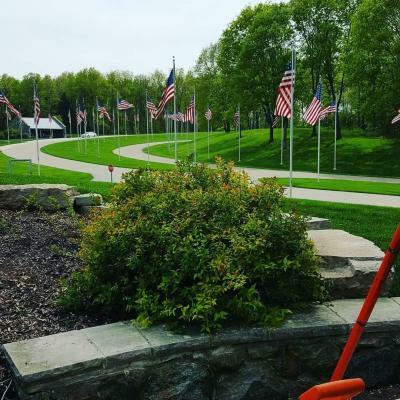 Each May, in recognition of Memorial Day and Military Appreciation Month, my fellow K Vets & Supporters visit Fort Custer National Cemetery in Battle Creek, Mich. to clean gravestones, rake grass and help with ground maintenance. A peaceful and humbling experience, cemetery cleanup is how we pay our respects to those who have served and gone before us. A veteran myself, I had an extensive career in the military. I served in a variety of Security Force roles, mostly concentrated in nuclear weapons, presidential security, counter-terrorism and air-based ground defense. After active duty, I joined the Air National Guard and was called back to serve following the 9/11 Terrorist Attacks. As a retired Master Sergeant of the U.S. Air Force and Air National Guard, I am honored to be a Kellogg employee and a K Vets member. K Vets & Supporters (K Vets) is one of eight Kellogg Business/Employee Resource Groups (B/ERGs) and an organization that celebrates military service, supports veterans and regularly highlights the benefits of supporting those who serve. When I joined Kellogg 10 years ago, I started as the Maintenance and Reliability Manager at our Battle Creek, Mich., plant. I soon learned of K Vets and became an active member. Through my position and efforts in the B/ERG, I had the opportunity to prove my drive, determination and extensive skillset – qualities I developed from my time in the military. Leadership quickly took notice, and, taking a chance on me, extended an offer to join Kellogg’s engineering department. True to the company’s K Values, this showed true integrity and respect, recognizing me for my diverse background, experiences and ideas. The K Values shape our Kellogg culture and are at the core of who we are, what we believe and are what brings us together as a global team. The K Values – integrity, respect, accountability, passion, humility, hunger, simplicity and success – are similar to what I learned and lived in the military. I am proud to work for a company that truly lives these qualities. Today, I have the great responsibility of designing Pop Tarts packaging as the Lead Packaging Engineer for Morning Foods Research & Development. Recently, Kellogg was recognized by DiversityInc as a Best Company for Veterans and included on the Military Times list Best for Vets Employers 2018. Dedicated to recruiting and retaining veterans, the company has a dedicated Veteran Career website listing available positions and information on the company. It’s clear that Kellogg is a company that lives its K Values. My time in the service taught me a great deal about the world and myself, shaping my values and beliefs. Traveling through 40 countries, I had the opportunity to interact with a diverse group of people, either alongside them or as a guest in their country. I am proud to work for a company that incorporates its values into its DNA and believes in a diverse and inclusive environment. Kellogg is a company that is proud to recognize our service men and women.